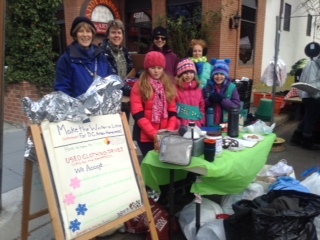 Jr Girl Scout Troop 3897, including leader Dominique Trudeau, graciously held a pre-clothing drive at the Palisades Farmers’ Market in Washington, DC last Saturday, November 23rd to benefit Gifts for the Homeless. The girls also kindly served hot tea and baked goodies for people dropping-off donations. Thank you Troop 3897! We appreciate your efforts, especially in the cold weather, to bring attention to our cause and to collect donations that will go to the DC metro area homeless through our annual clothing drive. Thanks also goes to Tommye Grant for helping to make this happen! Save the date! The 2013 clothing drive will be December 6-8. The drive is located at D Street between 12th and 13th, SW. See you there!